If last year’s blockbuster exhibit, Interwoven Globe, proved the power of textiles as a force in the interdisciplinary and cross-cultural exchange of art and commerce for more than three centuries, then this season’s tapestry exhibit at the Met Grand Design: Pieter Coecke van Aelst and Renaissance Tapestry goes a step further, honing the focus in on the oft overlooked art form of tapestry and more specifically, on the work of one artist, whose forward-looking and entrepreneurial spirit broke the mold on many levels. This is also a show to be appreciated on many levels. 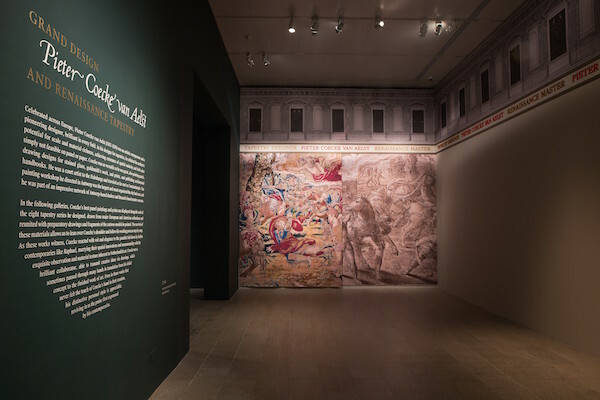 Not only will it wow you with the size and grandeur of these monumental woven works, in an innovative installation, but you will be astounded by the prodigious artistry, creativity and enterprising spirit of Pieter Coecke van Aelst. A true Renaissance man in every sense of the phrase, he is an unsung master whose time has come. 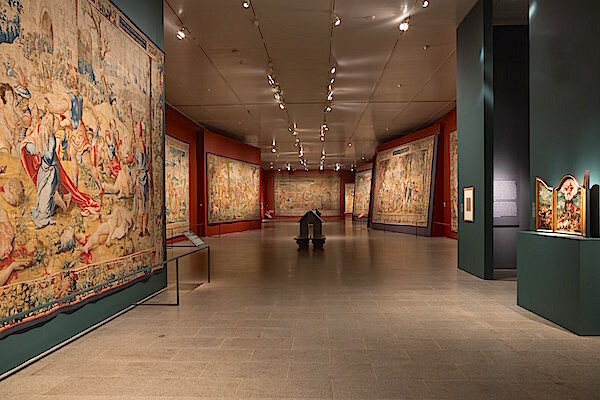 Even if you think tapestries aren’t your thing, you will be amazed by the interactive, humorous and thought provoking aspects of these works. Coecke was really a designer, whose work spanned a wide variety of media – from drawings and panel paintings, to altarpieces, to designs for stained glass and goldsmithing, to prints, architectural treatises and of course tapestries. And the show capitalizes on that, focussing on the process of design, illustrating how his artistry is integrated at every stage, both in technique and style – below a tapestry with its corresponding drawings and cartoons. It was in tapestries, however, with their enormity of scale and richness of materials (silk, wool and gold and silver wrapped threads), that Coecke reached his full artistic potential. I had the pleasure of walking the exhibit with Sarah Mallory, Research Assistant in the European Sculpture and Decorative Arts Department, who worked on the exhibition with Elizabeth Cleland, curator of the show and author of the comprehensive catalogue. Translating the many aspects of Coecke’s talents, Sarah’s insights were invaluable for an art aficionado but tapestry neophyte. I learned much more than I could possibly share here, but suffice it to say that I now need to return for a second viewing to fully appreciate Coecke’s many talents. Kunsthistorisches Museum Wien, Kunstkammer. ©Kunsthistorisches Museum/ Metropolitan Museum of Art, photo by Bruce White. Renowned and financially successful during his own lifetime, Coecke produced works for the most prestigious and powerful patrons of the era, including Henry VIII, Charles V, Francois I, the Hapsburgs and Cosimo de Medici. 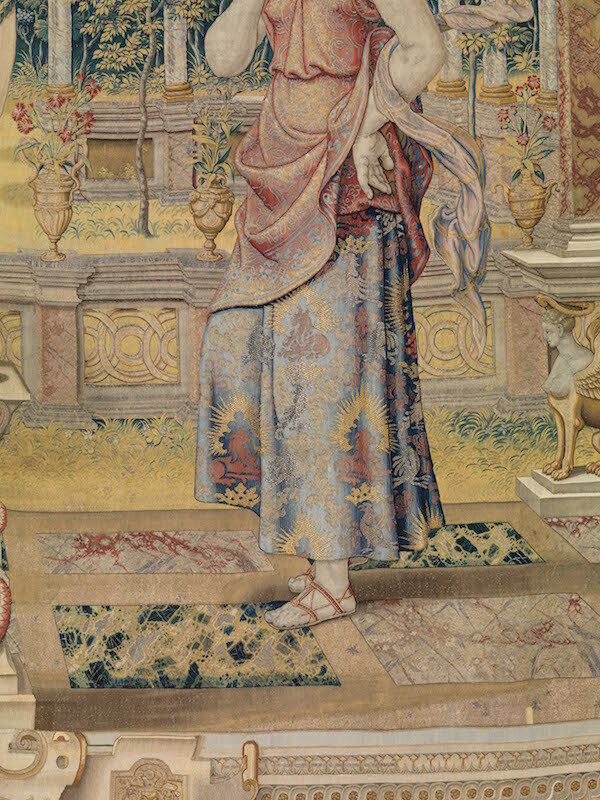 Tapestries were, in the Renaissance, a very celebrated art form, yet incredibly expensive to produce – Henry VIII, for example, spent as much on a set of tapestries as he did on a battleship. They were not only beautiful but functional – they helped keep heat in and drafts out. They were perfect for rulers of the time who had itinerant courts, as easy statement-making valuables to transport as they traveled from castle to castle. And just as current masters of the universe accrue expensive accoutrements to display their wealth and power, royals of the time were competitive, using art to establish their divine and intellectual prowess. Museum of Fine Arts, Boston. Charles Potter Kling Fund. ©Museum of Fine Arts Boston, photo by Saravuth Neou. In fact they would often buy the same sets of tapestries attempting to outdo each other or at least equalize the playing field. Thus tapestries became portable propaganda. 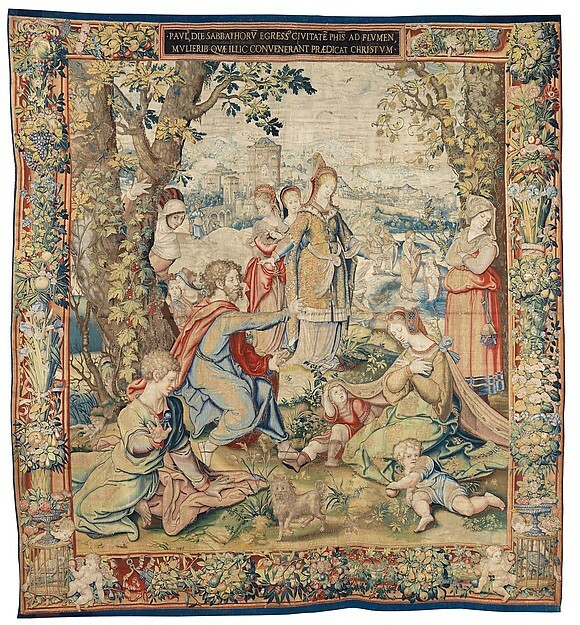 When Coecke first ventured out on his own (after working under Bernard van Orley), he didn’t take the normal route, waiting for a commission, but decided to design a tapestry series by himself. This was an unprecedented bold and entrepreneurial move, but Coecke was clever, seeing the importance of these works and the potential they held for attracting the attention of those with purse strings. His first set, Saint Paul, three scenes pictured above and below, sold immediately, to Francois I, followed by a second set to Henry VIII who requested two more scenes be added, upping the competitive ante. This series was ultimately woven at least nine times. 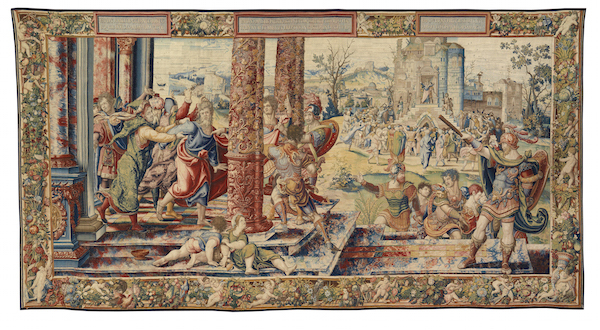 The exhibit features five tapestries from the Story of Saint Paul, which established Coecke as the premier tapestry designer of the time. KBC Bank Collection, Leuven. ©Metropolitan Museum of Art, Photograph by Bruce White. But what was it that made Coecke’s tapestries so in demand? Firstly, he was strategic in picking themes and stories that would be appealing and stroke the egos of these powerful leaders. St. Paul, for example, was a great disciple of the Christian faith and the author of much of the New Testament. These rulers were men in positions of power because they felt God had ordained them to do this with their lives or saw themselves as great evangelists for the faith like Paul. And these tapestries helped them build such images of themselves they were trying to project. Artistically, Coecke included beautiful fabrics and surface ornamentation. And, as Sarah pointed out, he made a point of acknowledging the viewer, of forming a connection. Take for example the first Saint Paul tapestry at the top. Here you see the figure in the lower left gesturing to us, as if to say, keep quiet, Paul is speaking. 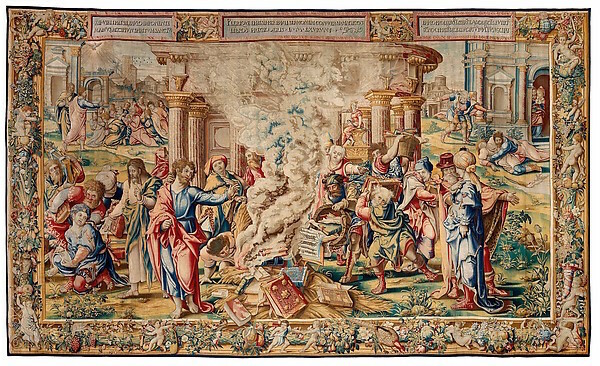 And in the next, the The Burning of the Books at Ephesus, note how the books are spilling out over the border, entering the realm of the viewer. In trying to form a dialogue with us, Coecke often tries to make us laugh or think, frequently with highly articulated details. 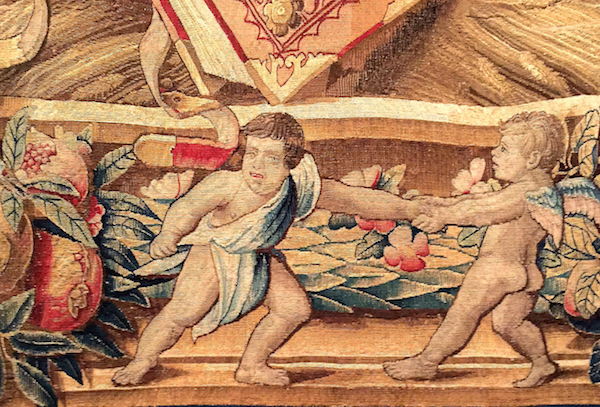 In the same border, a detail of it above, see how one putti is pulling the other out of the way of the falling volume – a whimsical touch that says, “I know you’re looking” so I will entertain you. And in a detail, above, of the larger Seizing of Saint Paul tapestry, you can see Coecke’s bold use of color, energetic compositions and expressive emotions. These, and his incredible use of details, are all aspects of craftsmanship and creativity that separated Coecke from the pack. Also, remember when looking at these intricacies that these pieces are woven, not embroidered. All had to be carefully thought out ahead of time and executed backwards! Patrimonio Nacional, Madrid ©Metropolitan Museum of Art, Photograph by Bruce White. In a later work, after trips to Italy and Constantinople, you can see a stylistic change that occurs in his work. 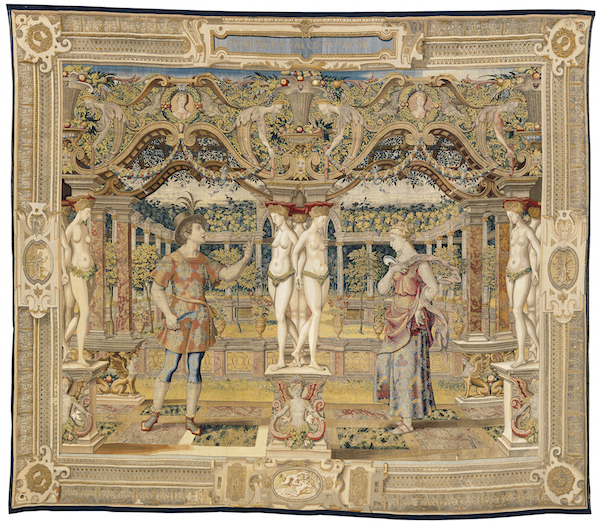 Calmer and stage-like, yet no less ornate in detail or material, it represents the introduction of the Dutch garden tapestry. Coecke was the first to use this conceit of indoor/outdoor scenery set in a garden. And now, rather than focussing on his energetic and emotive figures, he is drawing the line between reality and fantasy. Are the caryatids columns or real? It’s the idea of metamorphosis in a beautiful enchanted environment. The decorative details are stunning – take a look at the woven marble below. And as Sarah noted, it is the best fashion moment in the show. Her skirt is exquisite, woven with brilliant gold metallic thread. In real life it is breathtaking. 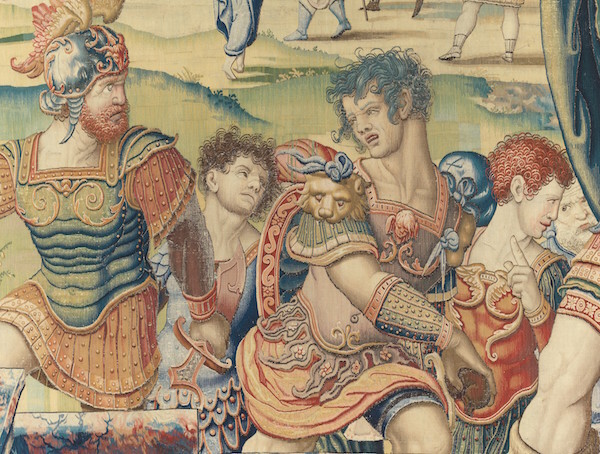 The making of a tapestry was the supreme example of creative collaboration, from drawings to cartoons to woven image, and Coecke, accomplished in many of the steps himself, was a perfectionist who oversaw and kept a hand in all the moving parts to ensure his vision was executed to his satisfaction. It was this combination of artistry and business savvy that sealed his success. 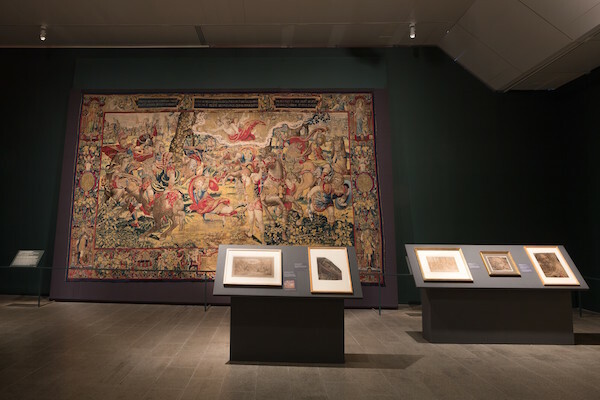 And assembling this show was an equally challenging creative effort, securing tapestries and coordinating artwork from around the world, many of which have never been lent or even seen. I salute all those involved. I have touched on merely a tiny portion of Coecke’s genius. I encourage you to experience this monumental show of tapestry at the Met for yourself before it leaves on January 11. This entry posted in art, art history, design, interior design. Entry Tags: art, art history, Metropolitan Museum of Art, NYC museum shows, Pieter Coecke van Aelst, tapestry, tapestry at the Met Bookmark the permalink. A fascinating post. How interesting that these tapestries have an interactive quality and were used as “portable propaganda.” And what a treat to have Sarah Mallory guide you through the exhibit enhancing your enjoyment….and ultimately, ours. Thank you. This is a fascinating art form and the exhibition is spectacular. Thank you for writing about it and I can echo that it is well worth the visit. Gracias por este trabajo tan magnifico,tanto en contenido como en exhibición. Stacey I am astounded by the intricacy of these tapestries. The detail in the last image of her skirt and the marble floor, amazing! The story of Coecke is also so very fascinating. 80 queries in 0.551 seconds.